This week’s featured researcher is Dr. Shawn M. Lehman, an Associate Professor in the Department of Anthropology at the University of Toronto. He completed his BA in anthropology at The University of Calgary, where he was an offensive guard on the 1985 National Championship football team. For his Ph.D. research, he conducted almost 2,000 kilometers of primate surveys in Guyana, South America. Dr. Lehman has spent the last 17 years studying lemurs in Madagascar. 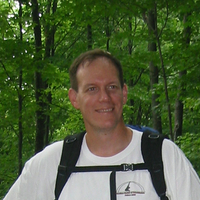 His research integrates evolutionary ecology and conservation biogeography to model primate responses to anthropogenic disturbances. 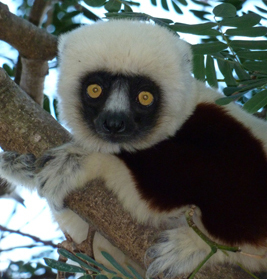 He aims to determine how lemurs respond to forest loss and fragmentation as well as edge effects. 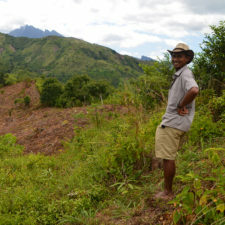 He conducts most of his field research in rare tropical dry forests in and around Ankarafantsika National Park, in northwest Madagascar. After years of undertaking surveys of lemurs in Madagascar, I literally missed the forest for the trees, as the saying goes. I’d spent considerable time and energy walking along freshly cut trails penetrating deep into the remaining forests on this island. Along the way, my research team and I saw – and were amazed by – the incredible diversity of plants and animals in the forest, many of which are found nowhere else in the world! 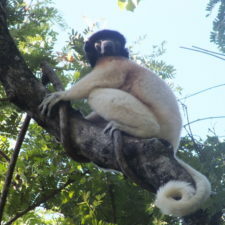 A Coquerel’s sifaka in Madagascar. The goal of all this walking was to determine which of the 100 or so lemur species were in each forest area. And if so, why? And if not, why not? This kind of work is often called biogeography, which is the study of the geographic distribution of different species of organisms and the factors that relate to their distribution (i.e. where they are and why). For example, primates that like fruit tend to be found near trees that provide it. Because some lemurs are active at night (nocturnal) and others during the day (diurnal), it takes almost 24 hours to observe both kinds of lemurs. There are even a few species that vary their waking activities across day or night, which makes for tired researchers! What I missed in all this walking was that there was so little deep forest left. Most of the remaining forest has shrunk into isolated fragments of varying size and shape in Madagascar. What these fragments have in common, however, is that each is influenced by what we call edge effects. Edge effects happen when conditions in non-forest areas, such as open grasslands, penetrate into the interior of adjacent forests. You’ve probably experienced these edge effects when you sought the cool shade of a tree or forest on a hot summer day. As you approached the cool, shady area under the tree, you experienced reduced temperatures and light levels in combination with increased humidity, resulting in a nice place for a rest, nap, or picnic. Edge effects are complex and not just beneficial to overheated travelers. The powerful, cyclonic winds that annually sweep across Madagascar can literally blow down many of the large trees that lemurs favor as a food resource in the exposed forest edges. How do edge effects relate to animals and plants in the forest? On a broader, biogeographic scale, these edge effects—which include abiotics (e.g., temperature, humidity, wind)—can shape and alter the forest edge, promoting the propagation and growth of thick, spiny trees that almost seal up the edge. In turn, these changes in abiotic conditions and plant community push into the forest, with varying depths and intensities. So, many plants and animals that prefer darker, cooler, and more humid conditions found in the forest interior may exclude themselves or be outcompeted by edge tolerant plants and animals. In larger fragments, only a small proportion of the available forest habitat is comprised of edges. But if these fragments shrink in size, these edges will make up a greater and greater proportion of available habitat. I realized that edge effects were the dominant habitat type across the island of Madagascar, and this determined the course of my research. In 2003, I started a new research program called Tropical Research in Edge Effects or TREE. 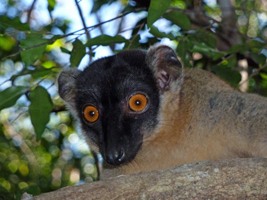 Since then, my students and I have undertaken research on plant and lemur responses to edge effects across the island, with most of our recent research being done on plants and lemurs in the rare tropical dry forests in northwest Madagascar in and around Ankarafantsika National Park. How do plants respond to edge effects? Our research has revealed that plants and lemurs respond in complex ways to edge effects. For example, we wanted to first determine if the biochemistry of plant leaves would register a strong edge effect along trails running from the savanna into the forest interior. Based on previous work looking at abiotic determinants of leaf biochemistry, we predicted that two biochemical markers (stable isotopes of carbon and nitrogen) would be highest close to forest edges, where trees and soils are exposed to more sun, drier air and higher temperatures. To our considerable surprise, we found that only nitrogen showed a strong edge effect, but it was actually lower near the edge and higher in the interior! Understanding this enigmatic result will take more scientific work, but we think this pattern may be due spatial differences in soil properties between forest and edge and interiors. 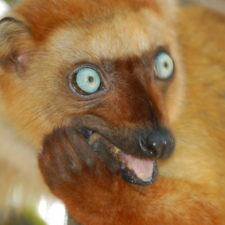 A brown lemur in Madagascar! 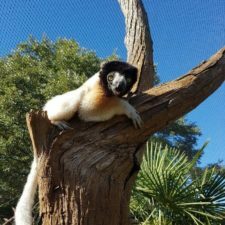 How do lemurs respond to edge effects? We then turned to determining how lemurs respond to edge effects. My students and I started tracking and surveying lemurs in the forest. What we found shocked and surprised us. 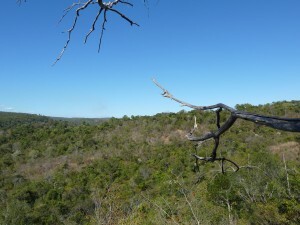 The three species of larger-bodied, diurnal lemurs avoided the forest edges; some species could not be found within 400 m of the savanna. The underlying reasons for this edge avoidance have so far eluded us, but they may be due to increased human activities near forest edges. Conversely, the four species of smaller-bodied, nocturnal lemurs had a more nuanced response to edge effects. Some species were more common in edges and others were more common in the forest interior. As with our biochemical research, the underlying patterns of these edge responses revealed an unexpected finding. Our biogeographic research on two of the smallest lemurs at our site, the aptly named mouse lemurs, revealed that in the endangered golden-brown mouse lemur, females weigh more in edge habitats than other females of the same species do in interior habitats. These results are the first reported for any mammal in the tropics, as far as we know, and may be the result of increased abundance of a favorite insect prey in forest edges. The view in Ampijoroa, Madagascar. 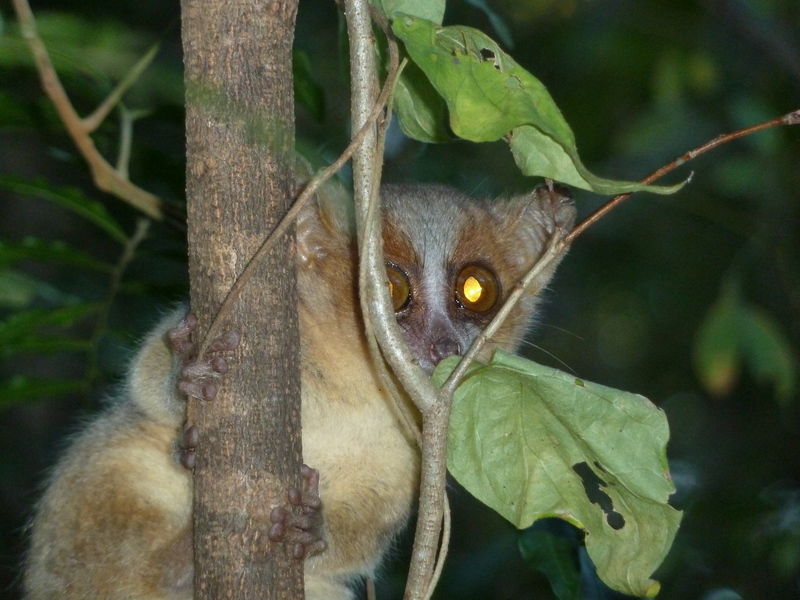 The question arises, however, as to why the far more common grey mouse lemur avoided forest edges and displayed no sexual or spatial differences in body mass? Sadly, lemurs don’t read the literature, so they consistently fail to follow our preconceived predictions and notions. In all seriousness, though, it is just these enigmatic aspects of plant and lemur biogeography that so fascinates and enthralls me. We hope to explore genetic aspects to these biogeographic patterns by collaborating with the amazing German research team led by Drs. Elke Zimmermann and Ute Radespiel, who have been working for decades on mouse lemur behavior and genetics in Madagascar. Tantalizing, early results of this collaboration hold promise to improve our understanding of the complex edge responses of plants and lemurs in Madagascar. Learn more about Dr. Shawn Lehman’s work at the University of Toronto. Follow the Lemur Conservation Network on facebook and twitter, so that you can get updates about organizations working across Madagascar to save lemurs.